The next commercial energy code cycle for most states is the International Energy Conservation Code (IECC) 2015 code and ASHRAE 90.1-2013 alternative path. For some states, the new code has already gone into effect as of January 1, 2017, but the exact timing of implementation depends on each state. Remember that each state is in a code cycle, which lasts 2 to 3 years or more. Theoretically, your state could switch in the next few months or in a few years. Check the status of your state energy code at energycodes.gov. Before we cover which states have adopted the latest code cycle, let’s briefly review some energy code basics. ASHRAE 90.1 and IECC have different 3-year cycles. IECC follows behind ASHRAE 90.1 by 2 years. For example, IECC 2012 references ASHRAE 90.1-2010. IECC 2015 references ASHRAE 90.1-2013. IECC adopts the latest ASHRAE Standard, plus any addendums and new data. This means that IECC is ultimately a more stringent code than the ASHRAE Standard. What’s in an Energy Code? 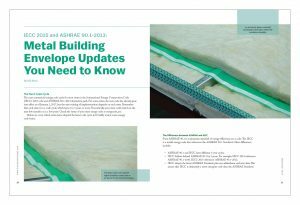 This article focuses on changes to roof and wall assembly code requirements, but remember that there are updates to other elements of the building envelope that you should also be aware of. Which States Have Made the Jump? The new code cycle will be effective in Georgia on January 1, 2018. First, it’s important to know that I base the most recent code cycle changes on comparisons of the IECC 2012 code and the ASHRAE 90.1-2010 Standard. If your state’s current code is based on the older IECC 2009 and ASHRAE 90.1-2007 Standard, you will see more significant envelope changes. Several states currently at the IECC 2009 code are bypassing IECC 2012 altogether and adopting IECC 2015. This is a large jump, and many metal building contractors will feel the pressure. If you haven’t used filled cavity systems such as liner systems or long tab banded systems in the past, you will be required to start using them. The choices are the same for the rest of the envelope. The building designer will have to make the decision to pursue either IECC 2015 or ASHRAE 90.1-2013. Once that decision is made, the entire building, including the envelope and mechanical systems and lighting, must follow the same path. Liner Systems and Long Tab Banded Systems: What’s the Difference? First, liner systems are typically proprietary and must meet ASHRAE’s requirements in order to be defined as a liner system. Long tab banded systems are usually non-proprietary and meet the specifications of a filled cavity system. Both systems provide High-R insulation to help meet stringent energy codes. One key difference is that certain banded liner systems also qualify as OSHA-compliant fall protection systems. Most long tab banded systems typically do not offer fall protection. Both options fulfill the metal building insulation U-value code requirements, so the system selected boils down to budget and preference. 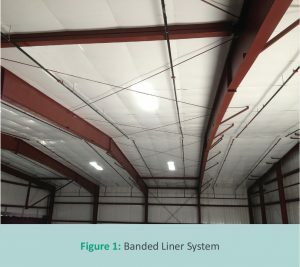 In a banded liner system, large panels of fabric or other vapor retarder material is supported by banding, and installed underneath the purlins. 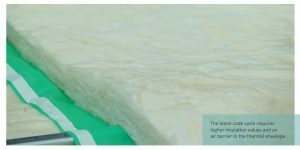 Multiple layers of unfaced and/or faced (air barrier) metal building insulation is installed on top of the supporting fabric and banding filling the cavity. The purlins are covered by the fabric vapor retarder in a banded liner system (Figure 1). 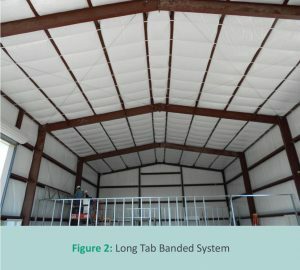 A long tab banded system is a single or multi-layer filled cavity system where the first layer is laminated metal building insulation installed parallel and between the purlin space. The long tab vapor retarder is joined or seamed on top of the purlins. 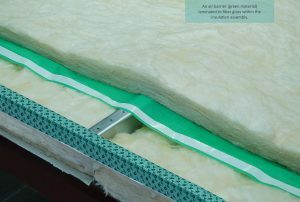 A second layer of unfaced insulation may be placed on top of the first layer and perpendicular to the purlins. Banding on the bottom of the purlins provides support. In a long tab banded system the purlins are left exposed (Figure 2). Non-residential Space: Spaces heated or cooled above semi-heated requirement (per ASHRAE 90.1-2013). Semi-heated Space: Space heated above 3.4btu’s/hr/ft2 and below 5 in climate zones (CL) 1 and 2, below 10 in CL 3, below 15 in CL 4 and 5, below 20 in CL 6 and 7, and below 25 in CL 8 (per ASHRAE 90.1 2013). If Semi-heated is not allowed based on the heating system output, then each climate zone has major insulation requirement increases under the non-residential space. This is based on the ASHRAE 90.1-2013 Standard; the IECC 2015 code has, for the most part, the same values. For example, using ASHRAE 90.1-2013, climate zone 5a requires a roof U-value of 0.037 and a wall U-value of 0.050. In order to obtain these U-values, a metal building would require either a liner system or long tab banded system for the roof and for the walls. IECC defines an air barrier as materials assembled and joined together to provide a barrier to air leakage through the building envelope. An air barrier may be a single material or a combination of materials. Both IECC 2015 and ASHRAE 90.1-2013 require buildings to have an air barrier in the thermal envelope, and to be indicated in drawings. The air barrier is also a checklist item on a COMcheck™ report (COMcheck is an online tool that can help builders with code compliance). The first mention of air barriers was actually in IECC codes in the mid-2000s. Buildings are now required to have an air barrier, and it must be located within the building’s thermal envelope. It can be placed on the interior side, exterior side, somewhere within assemblies composing the envelope, or any combination thereof. Materials with an air permeability not greater than 0.0040 cfm/ft² when subjected to a pressure differential of 0.3 water gauge are deemed to comply with this requirement. In IECC 2015, this can be found in section C 402.5.1 and C 402.5.1.1 (air barriers are not required in buildings in climate zone 2B). In ASHRAE 90.1-2013, this can be found in sections 5.4.3, 5.4.3.1.1, and 5.4.3.1.2. Exceptions include semi-heated buildings in climate zones 1–6. It is also mandatory to identify the air barrier and for it to be continuous across joints and assemblies. Joints and seams must be sealed and securely installed. Penetrations and joints and seals associated with penetrations must be sealed in a manner compatible with construction material and location. As the future of code cycles change, the air barrier requirement will only increase in terms of required performance. This is a good thing for the metal building industry, as new requirements propel new innovations.